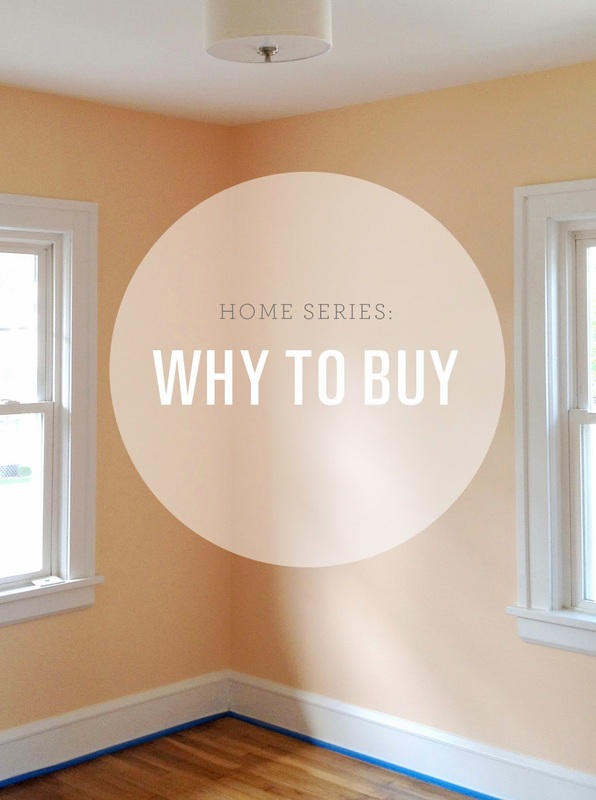 Today starts a little series of posts dedicated to all things HOME – specifically: homeownership, home buying, and our home's before + after. I have so many photos to share and thought the spring itch would be the perfect time to kick off this series on the blog. It's almost the peak time of year for listings to hit the market, so hopefully some of this will help + inspire any of you potential buyers out there! As a relatively young, unmarried couple we were cautious about jumping into buying – in this economy homeownership has become more of a luxury than a necessity. However, on the other side of a burst real estate bubble, you have a rock-bottom market that's steadily on its way up. The timing couldn't have been better: home prices were low, interest rates were low, and our neighborhood was maintaining its value. In so many ways, it was the right thing for us and I'm glad we dove in and never looked back. Investment – Really, this was #1. You're never too young to invest in your future. Homes follow the same rules as stocks: buy low, sell high. And we had a chance to buy low, on a house that we knew we could sell high just by sitting in it. Add in low cost/high-value home improvements, and you're sweetening the deal. After years of renting and tossing money down the drain, buying became the non-insane option. We knew we were staying in the area for a bit, so renting just made no sense. Landlords – There's nothing like having total control over your space, and we are project people. If we don't like something, we want to change it. Asking permission? UGGGGH. On the flip side, the control comes at a price. If your pipes start leaking, it's your problem. Furnace breaks? Ka-ching. For some people it's ideal to not have to deal with this stuff, but any replacements you make can add value to your house. And you're the one who gets to choose what pipes/furnace/etc. go into your house, so you can make choices based on energy efficiency/performance that can lower your bills. We've been lucky, but it's still important to have to have a little cash pile somewhere for when these things come up. Basement Fridge – Yeah, maybe one of my favorite things ever about our house. A basement fridge full of beverages. You open it and BEER is bountiful. I might be a man. Neighbors – Trust me, even in a house, you can (and likely will) have annoying neighbors. But I'll take anything over hearing my downstairs neighbor get screwed by a guy twice her age every night. Yeah...NOPE. TOO CLOSE. Yard – We still joke that we bought our house for our dog. He has plenty of room to run, and I don't have to leash him each time he has to go potty. I'm lazy about that so I guess it was more for my convenience than his. Other obvious yard perks: we get to have a garden, grow herbs + veggies, and don't have to head to the bar to drink on a patio (although of course we still do). Customization – This relates to the "landlords" reasoning...do you want to wallpaper that nook? Rip those bushes out? Re-tile the bathroom floor? Guess what – you da boss, baby. Noise – As a couple who favors music of the bass-heavy variety, we are quite happy with our freedom to crank it up. Neighborhood – We love being a part of a neighborhood, and there's nothing like handing out candy on Halloween. For some reason, that's one of our favorite things to do and it's a reminder of how much we love where we live. We wanted to be more than transient members – by putting hard work into improving our house, we feel like we are helping to improve our community as well. We wanted to give an old Lakewood house some TLC and leave it better than it was left for us. Everyones wants and needs are different, so I would love to hear about what motivated you to buy (if you have bought) or why you are hoping to buy in the future. Has it been a good experience? A tough one? Buyer's remorse? I'll be back next time to share some before + afters, and some tips/lessons learned about the buying process. I am super envious of your basement fridge. I purchased my condo 3 years ago and I love the freedom to do/paint/renovate anything I want! Jaclyn, that is awesome that you own your condo! That freedom is really great. Did you rent it before purchasing it?